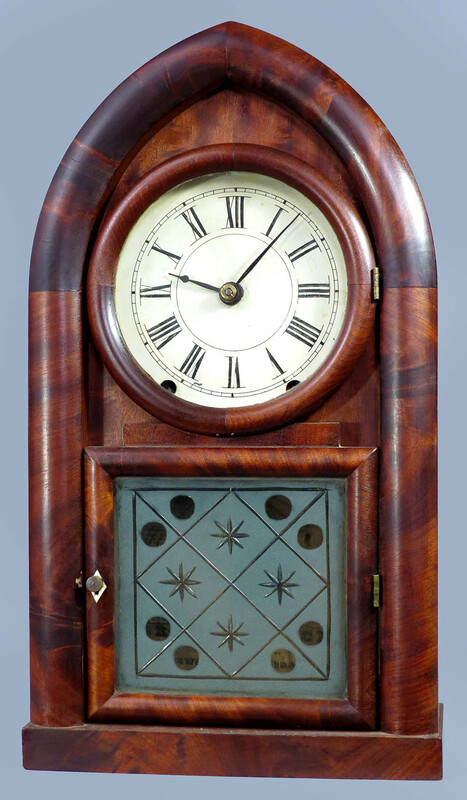 9028 Fine, early beehive clock by Brewster & Ingrahams. This is a very nice clock and it is in quite good condition. The mahogany case has been nicely refinished. There are some veneer losses on the left side of the base but the rest is just about perfect. It has an exceptionally nice geometric cut glass panel in the door plus an original upper glass. A brass knob has been added to replace the missing key lock in the door. The label is complete and it is all quite legible. It has the original painted zinc dial with raised chapter ring and it is in much better than average condition. This clock comes with the original pendulum and key. The minute hand is a proper replacement of the correct style. This is an eight-day clock with hourly strike on a gong. It will need a cleaning to be put in good running order. The movement is the flat front style and is signed. 9030 New Haven beehive clock in “as found” condition. The mahogany case was refinished a number of years ago and a bit of cleaning along with some polish would make it look much better. There are only two or three quite small veneer chips. The reverse painted tablet is a view of the Congress buildings and that painting does have some paint loss. The upper glass is missing. The label is quite dark and missing a small portion but it is still legible. The numerals on the painted zinc dial have largely worn away. The pendulum and hands are reproduction replacements. This is an eight-day clock with hourly strike on a gong. The movement has not been serviced in many years and that will need to be done to put the clock in running order. 18 ½ inches tall. $85. 9031 Ingraham Grecian mantle clock. These have always been a popular model partly due to their rather unique design which comes directly from the Greek Revival time period. The architecture of the time contained the same elements that make up this clock case design. I believe this particular case is made of figured walnut veneers. It has the original finish and a little bit of cleaning would make the beauty of the veneer more obvious. There is a small blemish visible under the left side rosette but the rest is fine and all the veneer is tight which is not always the case on the rounded portion of the top. The dial paper is in very good condition and it has a fairly good label of the typical green color. It comes with the original pendulum while the hands are old replacements. This is an eight-day model with hourly strike on a bell plus alarm. The movement needs cleaning and some bushings are rather loose. 9032 Ingraham Grecian shelf clock. It appears that this clock was refinished many years ago and it now has developed a good, soft patina. The case is rosewood and it is in excellent condition without any splits, chips or damages. The dial paper has yellowed a bit and a little of the green label is missing at the bottom. The hands, glass and pendulum are the originals. This is an eight-day clock with hourly strike on a bell plus alarm. The movement needs repair to one of the clicks and one pivot. 14 ½ inches tall. $165. 9033 Ingraham Doric mantel clock in a candy-stripe case. This is a very nice clock in good, original condition and ready for your shelf. This unusual candy-stripe case has always been popular because of the unique and eye pleasing design. The case is very clean and refinished. There was one light colored veneer chip at the bottom center and that has been colored in since the photo was taken. Originally, the circles and rosettes on the door were probably grain painted and now they are plain. The dial paper is in very good condition and it has an excellent, very legible label. The black background on the goldleaf decorated glass has been redone. 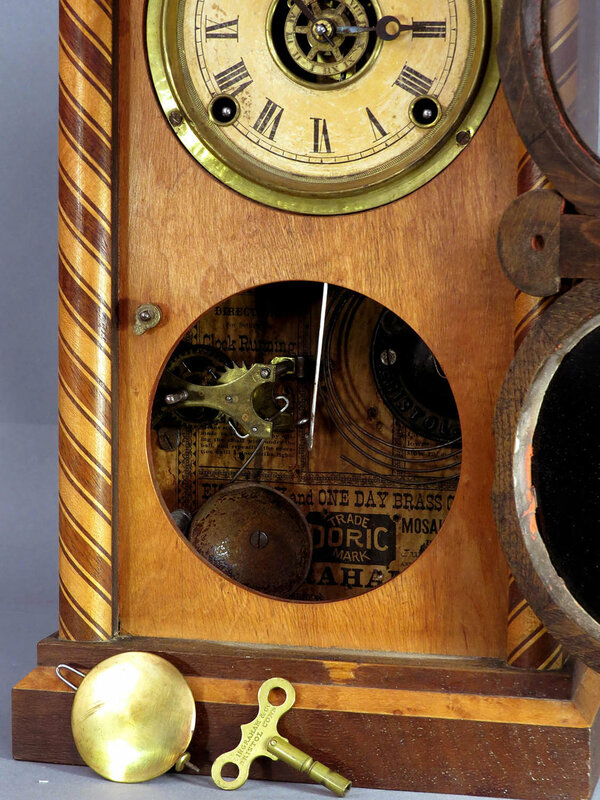 This clock retains the original hands, pendulum, signed gong base and signed key. This is an eight-day clock with hourly strike on a gong plus alarm and it is running. 9034 Ansonia Birmingham mantle clock. 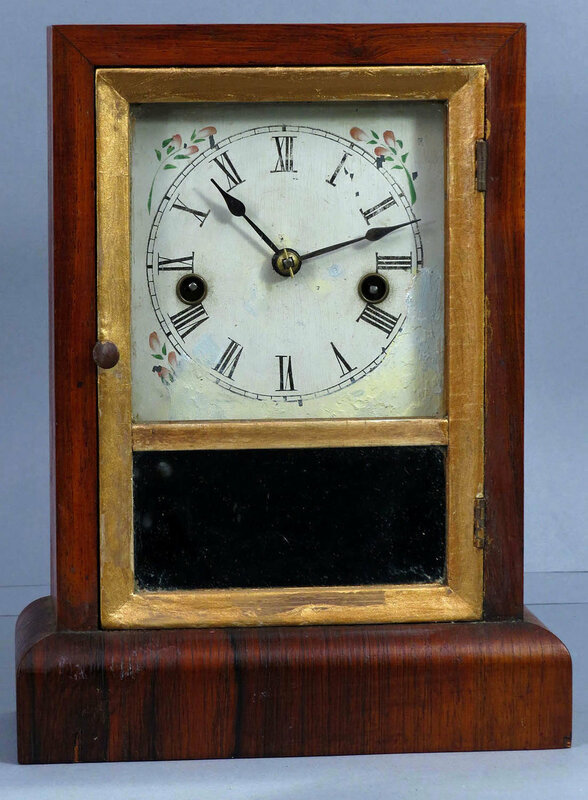 This is a great looking little clock and at only 10 ½ inches tall it might be considered a miniature version of the average mantle clock. The case is solid mahogany with a perfect original finish. There is a blemish/dent at the very top center but that is the only flaw. There are cast brass columns plus a heavy cast brass bezel with beveled glass. The porcelain dial is exceptionally nice with raised blue numerals. It is signed and there are no chips or hairlines. This clock retains the original hands and pendulum plus it has a very good label. This is an eight-day model with hour and half hour strike on a cathedral gong and it is running. 9035 Ansonia Galata mantel clock in “as is” condition. 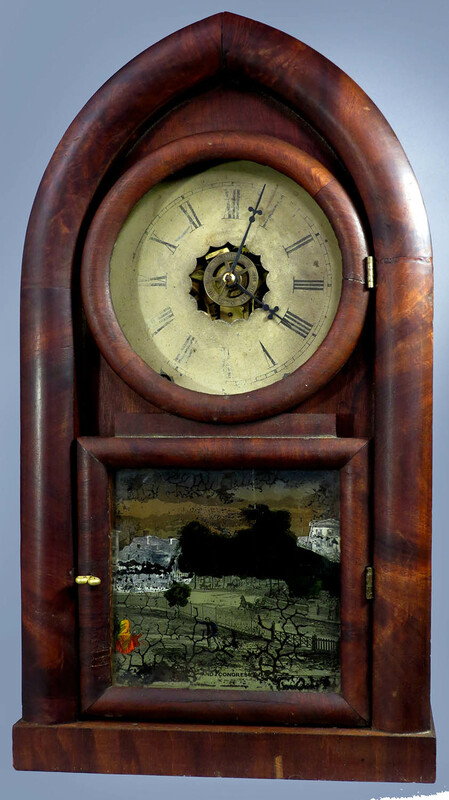 This clock is in need of some TLC and perhaps restoring this clock is just the project for you. The mahogany case is actually in quite good condition, needing just a good cleaning of the grime on top of the original finish. There are no chips or damages to the veneer but the door glass is missing. It has the original black flocking on the backboard. It has a signed beat scale and three fairly good labels on the back. It is lacking the center portion of the dial and the outer portion needs to be carefully cleaned. The hands and pendulum are replacements while it has an old key. It has a good quality eight-day signed movement with Geneva stops but that movement is very dirty. The movement feet have been moved creating some extra mounting holes but it is the original movement for this case and dial. 8025 Henry Sperry grain painted cottage clock. This is just like the clock mentioned earlier. The case for this one is even cleaner than the other and the rosewood graining is very vibrant. The glass in the door is the original but the decoration at the bottom is a later replacement done on paper that has been pasted behind the glass. The painted dial is the original but you can see that the signature is rather faint and there is a scratch in the 11 o’clock area. The hands, pendulum and key are the originals. There is a nice green label on the interior. This clock has the same 30 hour upside down movement as mentioned for the previous clock and it is also running. This clock needs a bit of restoration but it is priced accordingly. The mahogany and rosewood case is in good condition but the door has been repainted gold. It appears to have the original mirror in the lower panel. The lower section of the dial has been rather poorly touched up. It has the original hands, pendulum and key. There are remnants of the label on the back. This is a 30 hour clock with hourly strike and it is running but note that the strike mainspring is missing. 2322 Gilbert 8-day cottage clock. 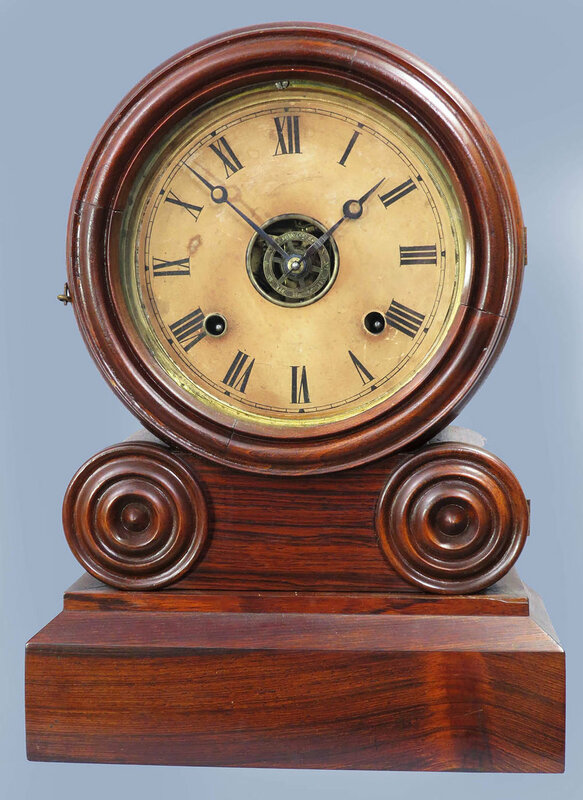 This clock has a rosewood case with the original finish which would look much better with a bit of cleaning. There are several small veneer chips at the edges. The painted dial is in excellent condition plus it has the original reverse painted glass and a very good label. The hands, pendulum and key are the originals. This is an eight day clock with hourly strike on a coil gong. It came from a collection were it had not been run for many years so it is overdue for a cleaning.